Tromso is a place you go to get close to nature. Whether it’s chasing the northern lights, whale watching or dog sledding in the Arctic, there’s a tour available. We recently spent four nights in this Arctic city, dubbed the ‘Paris of Scandinavia’. Tromso looks quite manicured and orderly but Paris? It’s a hard parallel to draw. The northern lights season runs from September to April. Up above the clouds they might indeed be dancing in their glorious colours, but during a snowstorm, us mere mortals on terra firma have no chance of seeing them. So, even though a tour is marketed as a husky sled adventure under the northern lights, this is obviously very much subject to the vagaries of mother nature. The tour begins with a bus pick-up outside the Radisson Blu hotel in the city centre. Happily, the wait in the cold is not long and before time we’re on our way, about 30 minutes’ drive, to Villmarkssenter – a wilderness reserve dedicated to the Alaskan husky breed and noted for their stamina in pulling sleds through the snow and ice – as opposed to the Siberian husky which apparently is bred for speed. In early December and in snowstorm conditions, there’s precious little daylight available in Tromso – the permagloom lifts (if you’re lucky) around 11am but it’s pitch black again by 2pm. The Villmarkssenter is lit up with fairy lights on all the buildings and the initial impression is terrific. 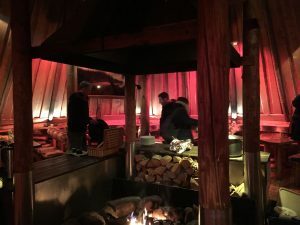 We’re directed into a hut to be issued with a thermal suit each, plus a pair of snow boots, leaving your own outer layers and boots inside to remain dry. Divided into two groups (there are only four sleds available), the first groups are taken off by the guides, while we’re introduced to the puppies first, followed by a wander through the kennels to greet the other dogs. The puppies are full of energy and are more interested in playing rough and tumble with each other than interacting with their visitors. When you do catch one and scoop them up, they’re very cute. We’re warned to keep our wits about us in terms of any bags, gloves or scarves. The puppies are noted pilferers of such items and scarves in particular are at risk of being snatched away as a prize. We go crunching through the snow to visit the other dogs. Each of them is on a chain to keep them close to their kennels and also to ensure the centre’s breeding program can be managed. Apparently, apart from veterinary reasons, it’s illegal to neuter the dogs so their breeding at the centre is carefully orchestrated. We’re warned that the dogs are strong and often jump. The staff advise us to make sure we have a firm footing in the snow to avoid being toppled by a boisterous pup. For the most part though, they’re all sooks. Once you approach them and start patting, they just want to stay close and get more scratches. We’re asked to move throughout the kennel area so the dogs at the far end get some attention too. It’s easy to tell when the sleds with the first group are close to returning – the dogs all start to get excited and howl. Before long, we’re seated in our sled for two (see the picture at the top of this post) and wrap a blanket over our legs. And we’re off. We go in formation along a standard track, each of us with a guide steering from behind, who uses a light on his head to illuminate the way at times. The snow is pelting down and the route is full of fresh powder which means the dogs have to work that much harder to plough through. We had no goggles or similar, so had to shield our eyes from time to time from the driving snow. But the trip is magical. The dogs clearly love what they do and are expertly trained to respond to the sled driver. Our course is around 8km but in clear conditions on icier trails, the dogs can cover as much as 15km in the same time. 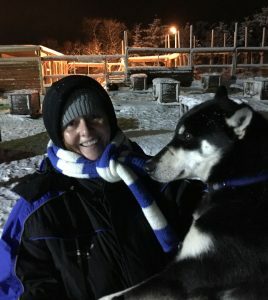 At the end, we’re encouraged to give our sled dogs as much affection as possible. It’s surprising how small some of the dogs are but they’re obviously incredibly fit and strong. From there, we’re ushered into a big circular room with a roaring fire in its centre. Steaming bowls of fish stew are ladled out and we’re offered tea and coffee. It’s a perfect antidote to the chill outside. To finish, we’re given hunks of a very fine chocolate cake. What’s not to like? And we’re done. The bus is ready to depart at 10pm (the tour began at 6pm) and we head back to the city. This is a well organised, enjoyable tour with good levels of information provided by the team which is from all over Europe. 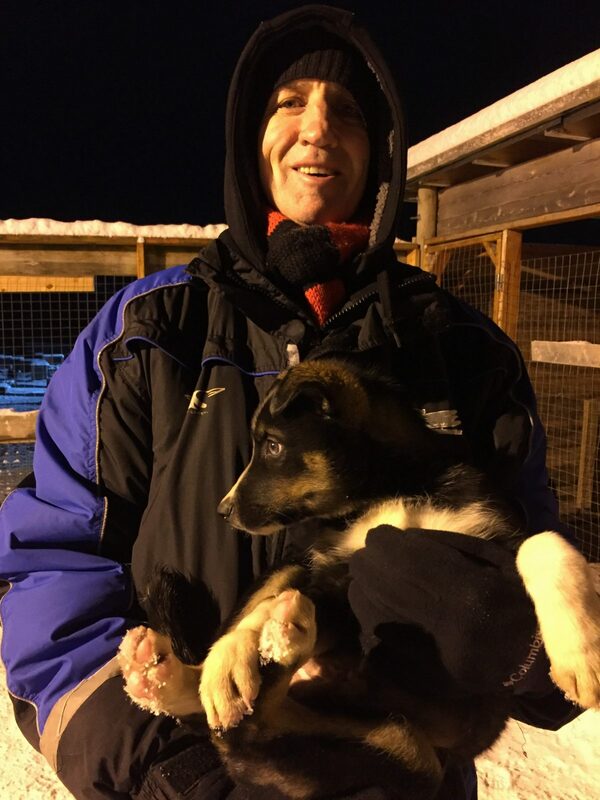 Our sled driver was from Bordeaux and he commented he was interested in trying dog sledding all over the world. It’s not an inexpensive tour – but there are few things that are cheap in Norway. Given most people only have the opportunity to do this once, treat yourself to an amazing experience. All the photos here are shot on my iPhone and just be warned that they generally don’t like the intense cold, so try to protect your phone as much as possible if that’s your only means of taking photos!